What Makes The COLD So Hot? That's right, Jackson. And getting colder all the time. At a time when many artists in the hierarchy of pop's mainstream sound isolated and confused, when the major record companies speak only the languages of Wall Street and Madison Avenue, and when commercial radio plays only what a handful of promotion men tell them to, where do you find interesting music? At the corner bar, of course! New Orleans, in simpler days a concert stop for national recording acts, has, in the absence of larger promotions, turned to its nightclubs and its local bands. Following a national trend toward smaller venues brought on by worsening economic conditions, the improving club scene has drawn talented young local musicians out and put them on stages. The year 1980 saw the deaths of Professor Longhair and Big Chief Jolly, progenitors of the second line rhythm, men who helped make the black music of the streets popular among white listeners. As one era ends, someone once said, another begins. The year also saw the emergence of a large number of white pop bands on the club scene, bands with fresh energy and new songs. Harsh economic realities demanded that these bands simply draw people into bars and make them feel good, move with the music, and most importantly, drink. Those able to accomplish this found steady work in the clubs, and some gathered large and loyal followings from among the dancers and drinkers, people who would create a party around a certain band and support it on a continuing basis. The standout among the young and energetic bands to emerge on the local scene during the past year is the Cold. Playing a tense, up-tempo style of pop music that owes as much of the influences of the Sixties as to those of the Eighties, the Cold has reached and cultivated a large audience. The Cold, five young performers of varying degrees of musical proficiency, manage to create a total effect of sound and feeling that is far greater than the sum of its individual parts. - Kevin Radecker (guitar and vocals) - a bubbly yet intelligent presence on stage, Kevin talks, sings, and lends personal pizzazz to the band's group persona. - Bert Smith (guitar and vocals) - a poker-faced ex-journalist, Bert looks like the quiet type, plays a straightforward rhythm guitar, and sings with uncommon conviction. - Barbara Menendez (vocals and organ) - animated to the point of exuberance, the mini-skirted "Babs" is the visual focal point of the band, whether singing, playing her rudimentary keyboard parts, or just dancing. - Vance DeGeneres (bass and vocals) - a handsome ex-marine with a broad musical background, Vance writes most of the Cold's original music, plays a rock-solid bass; and is a heart-throb for scores of young females. - Chris Luckette (drums and vocals) - the most gifted member of the Cold, Chris packs a genuine wallop with his drumming, and his voice is strong and supple even in the midst of his most thunderous percussive flurries. Instrumentally the music is built from the bottom up, with bass and drums providing the punch for the layered one-dimensional guitars and keyboard. Vocals are split five ways, though Menendez and Radecker sing most of the lead vocals with a good deal of spirit and wit. True to the spirit of pop, the tunes are tightly arranged and concise, seldom reaching three minutes in length. 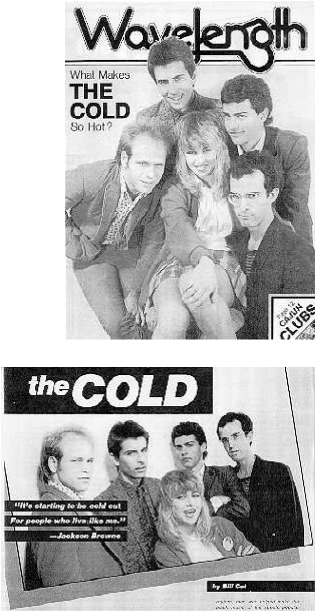 While DeGeneres supplies most of the musical hooks, all five members contribute to the Cold's original tunes. Most are variations on traditional boy-girl pop themes, tempered only by a sly sense of humor. Cover material in their repertoire includes such diverse selections as "Hawaii Five-O" (the TV theme), the Outsiders' "Time Won't Let Me", Petula Clark's "Downtown", the Yardbirds’ "Shape of Things", and Elvis Costello's "Mystery Dance". The band is able to inject much of its own enthusiasm into the songs while retaining the credibility of the originals in tight, energetic arrangements. The Cold makes people feel good on the dance floor at least partly because they feel good on stage. The band's uncanny rapport with the predominately young, white, upper-middle class audience is as much responsible for their popularity as anything emanating from the loudspeakers. Pop(ular) music depends as much on a feeling as a sound, and when the feeling is genuine the audience knows it and responds. In a small room like Jed's or Jimmy's this collective pathos, shared by hundreds of people, is infectious, and at times nearly overwhelming. Transferring the feeling to a immutable product (a record) can be tricky business. Nevertheless, the Cold's single "You" / "Three Chord City", has somehow managed to capture the essential feeling the band projects on stage every weekend. Produced by Knight Studios entrepreneur Traci Borges, the single has enjoyed as much success as any locally produced 45 in recent memory. The ever-supportive, non-commercial WTUL was the first to give it local airplay, then WEZB, but with some prodding by manager/promotion-man Bruce Spizer, even WQUE and WTIX added the record to their tight commercial playlists. This is no small accomplishment for a band that played its first gig just one year ago. Though a second single has already been completed at Knight Studios, the Cold's avowed aim for 1981, according to Spizer, is to land a recording contract with a major label. Having shown the ability to produce a commercially palatable single on their own will certainly help the cause. One can only hope that this young band that has come so far in such a short time will go on to greater successes with their freshness, enthusiasm, and originality intact.